Preface. General Aspects. Mental models of computer systems: Visual languages in the mind (G.C. van der Veer). Cognitive systems engineering for visualization (D.E. Mahling). Design as common ground (J. Rheinfrank, S. Evenson, W. Wulff). Visual Explanations. Use of visual media in explanation (A.G. Sutcliffe, J.S. Darzentas). Cognitive maps: A basis for designing user manuals for direct manipulation interfaces (P.W. Fach, T. Strothotte). User Interface Specification, Visual Interaction Language. Prototyping of static and dynamic user interface properties by direct composition (M. Schneider-Hufschmidt). A visual language for task-oriented user interface specification (F. Arefi, M. Milani, C. Stary). The world of objects - A visual object based interaction language (F. Penz, M. Manhartsberger, M. Tscheligi). Programming. Event handling in a visual language using dynamic icons (A.A. Schoberth). Diagrammatic techniques for the visualisation of object oriented programming (D.M. Temple, S.P. Guest). A tool for visually realising the data-flow programming paradigm (S.P. Guest, J. Polák, R.P. Knott). Visual expression of concurrent systems (J.P. Loyall, S.M. Kaplan). Data Bases. Visual re-presentation of database information: The flight data strip in air traffic control (D.Z. Shapiro, J.A. Hughes, D. Randall, R. Harper). 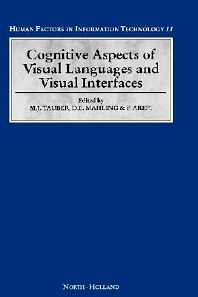 This volume contains selected papers from the 10th Interdisciplinary Workshop in Informatics and Psychology which had as its theme Cognitive Aspects in Visual Languages and Interfaces. Visual languages in general, visual programming languages in particular, and graphical or visual user interfaces are increasingly regarded as important improvements for the interaction between people and artifacts. Visual and graphical user interfaces have already a history of a number of years in terms of research and development. The focus on visual languages and visual programming languages, however, is more recent. The development of graphical user interfaces was accompanied and reinforced by psychological research but visual languages are still mainly inventions of designers and not designed on the basis of principles derived also from knowledge of psychology or other behavioral sciences. The presentations and discussions at the workshop showed increasing interest in paradigms of visual languages and their psychological foundation. Visual languages and interfaces must be seen as means to support and enhance represention, application and processing knowledge visually. The study of the cognitive aspects in visual languages and interfaces is thus an important part of Human-Computer Interaction as a discipline concerned with the design, evaluation and implementation of interactive computer systems for human use and with the study of major phenomena surrounding them (definition of HCI in the ACM SIGCHI Curricula for Human-Computer Interaction). This book will stimulate future research in the area of Human-Computer Interaction and Visual Languages.